At a discount retailer the other day, I came across an old hardback copy of a Rod Carew autobiography, co-written by former sports writer Ira Berkow. I quickly realized it was too tempting to pass up, so I paid the nominal fee and settled in to flap through its 236 pages. Right away I noticed something was wrong. 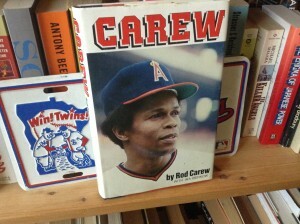 The book, published in 1979, covers — and only covers — Carew’s 12 seasons with the Twins and yet guess what’s on the front cover? Carew, dressed in the signature look of another team: the California Angels. Yep. Carew and the Twins did not part on good terms in 1979, the year he was traded to the Angels in exchange for four players, including Ken Landreaux. The trade did not upset Carew so much as what instigated it: former team owner Calvin Griffith’s racist comments about African-Americans, Carew and others. Carew had good reason to part company with the Twins and he found more money and a welcome home in Anaheim, California. But that part of the book is one of its few topical moments. Instead, it’s mostly introspective, with Carew reflecting on life in Panama, a difficult relationship with his father and a good chunk of it about marrying a Jewish woman and gaining acceptance from her family. His wife, Marilynn, even pens a chapter in the book. So, if you’re looking for a book about baseball in the 1960s and 1970s, with a detailed look at the players and managers of the Twins in those years, as well as those Carew faced over the years, this is not it. Some stomachs might be too queasy for chewing tobacco — might be too queasy even for the subject — but it’s really been a positive thing in my life for several reasons. One, as I mentioned, was that it keeps my mouth moist. Another is that it helps keep my weight down during the off season. Since I’m chewing, I’m not hitting the refrigerator all the time and noshing. … I’m convinced that chewing makes me a better hitter, too. I get a steadier view of the pitcher when I’ve got a hunk of tobacco in my right cheek. And what a beautiful hitter to watch. Unbelievable. He could hit anyone, right-handers, left-handers, consistently. And he almost always hit the ball hard. He could hit to all fields and with power. I’ve seen him hit pitches that amazed me at times. I saw him hit pitches that were so low they were like lying on a tee, and he’d put them 450 feet into the stands. He stood up there in his knock-kneed manner and just ripped. Other guys have had it tougher. Dave Boswell (who once won 20 games for the Twins) is back in his hometown, Baltimore, and works at a brewery there. His job is to clean out the vats at day’s end. He had been invited to the Old Timers game in 1977, but didn’t come. He wanted to bring his wife. The Twins pay for only the player’s plane ticket. Dave said he couldn’t afford her ticket, so he stayed home. Zoilo Versalles (AL MVP in 1965) is a janitor in Minneapolis, and sometimes drops into the clubhouse for a visit. Well, the Twins played like crap Saturday night, extending their early-season losing streak to five games after a 7-0 loss to the Royals. It’s apparently the worst start in franchise history, although they also started last season 1-6. The team’s not hitting, not playing good defense and not pitching well. And that combination will not win you many games. Tommy Milone pitched well for three-plus innings and then gave up back-to-back home runs. He eventually surrendered four runs, but only two were earned because of two errors behind him. If I had to second guess Paul Molitor, I would’ve let Milone pitch longer, down 4-0, because reliever Casey Fien appeared to have nothing and got hit hard, surrendering three more runs. Did I mention that nobody’s hitting? Ricky Nolasco gets the ball on Sunday.